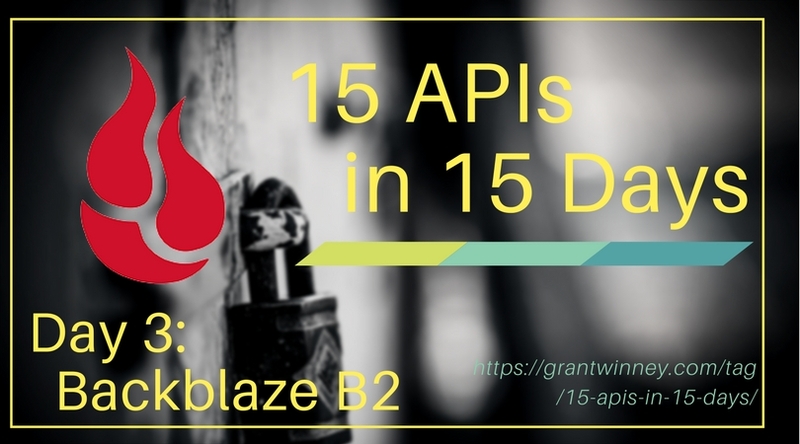 Continuing my 15 APIs in 15 Days challenge (also on GitHub), today I want to experiment with the Backblaze B2 Storage API. If you're not familiar with Backblaze, they're a handy and inexpensive service that backs up your computer. I've been using them for years, and I even had to restore files when my hard drive succumbed to the "click of death" a couple years ago, so totally worth it. 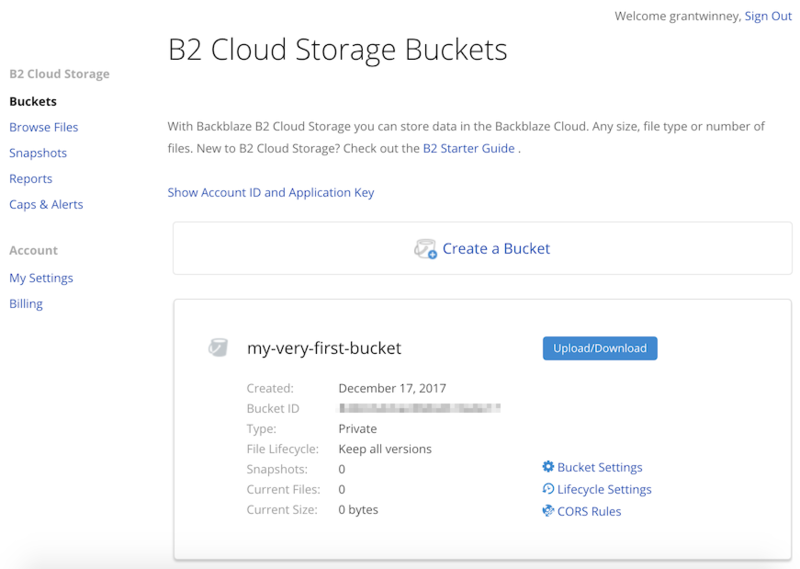 Backblaze has a cloud storage service too, in the same vein as AWS, Rackspace, etc. When you sign up they give you 10GB free to mess around with. As usual, you'll need to prove who you are before you can go making requests. While logged in to the Backblaze site, click on the "My Account" link in the upper-right, then the "Show Account ID and Application Key" link. 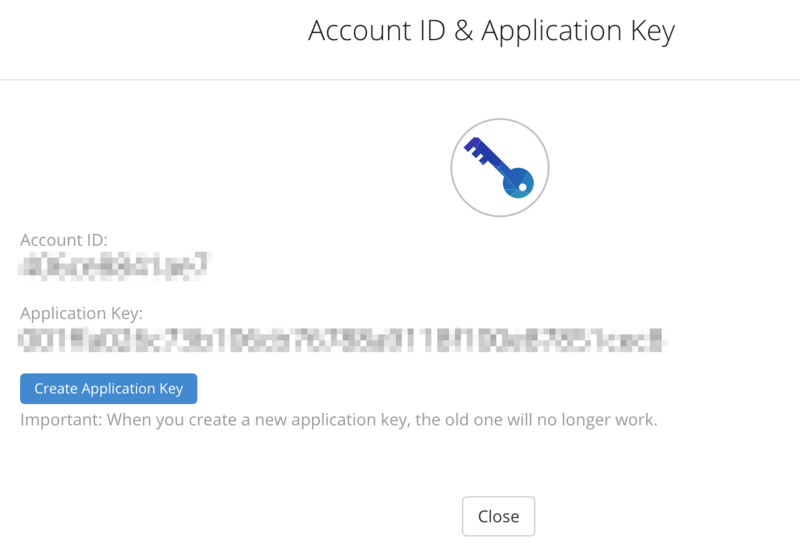 A dialog captioned "Account ID & Application Key" appears. Press the "Create Application Key" button and you'll have the two vital pieces of data you need for authenticating with Backblaze. 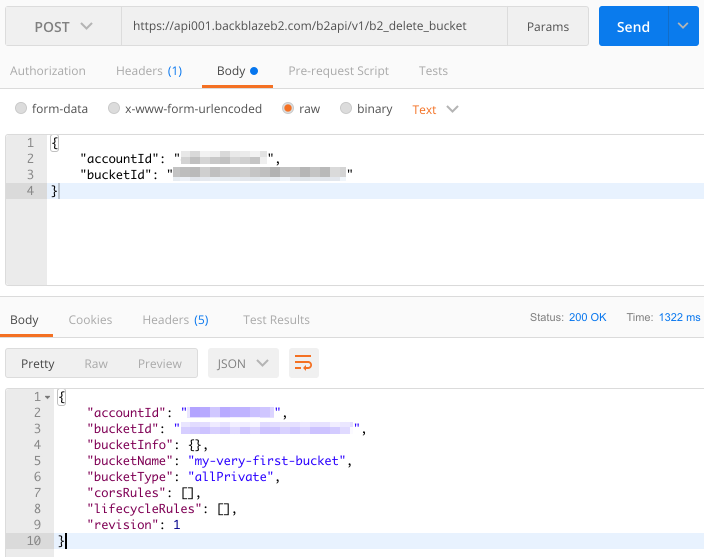 You'll need to make an API call to get the authorization token, which then lets you make other more interesting API calls. To get the authorization token, you can do one of a couple of things. If you have curl available in your terminal, just run this, substituting ACCOUNT_ID and APPLICATION_KEY with the appropriate values. 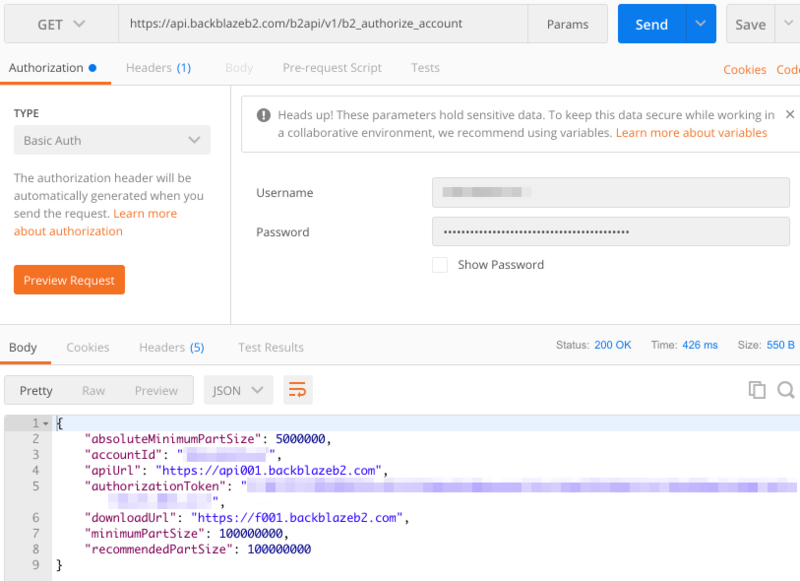 You can also do it from within Postman, by doing a GET on https://api.backblazeb2.com/b2api/v1/b2_authorize_account, and setting up authorization like in the following screenshot. Just add the ACCOUNT_ID and APPLICATION_KEY in the username and password fields, and click the "Preview Request" button. 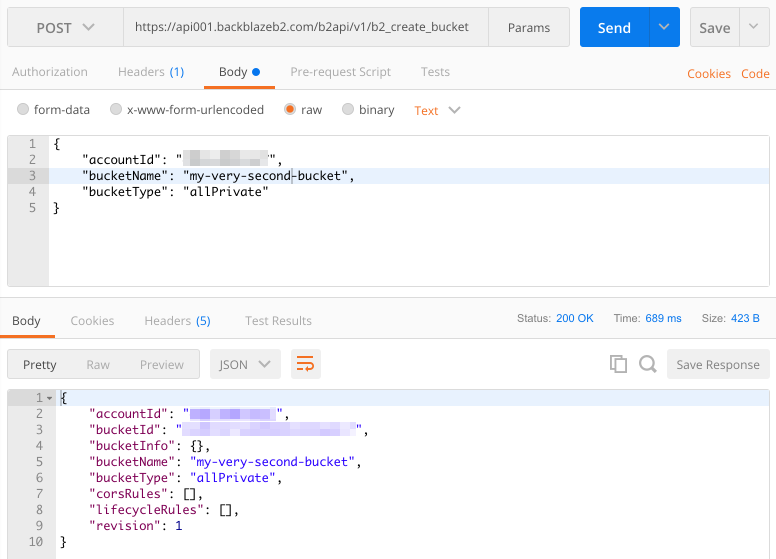 That adds a new "Authorization" field under the "Headers" tab, which is the base-64 encoded version of your account id and application key. There's a lot you can do - check out the docs. I'll just touch the tip of the iceberg here. Let's try creating a bucket. Use the apiUrl and authorizationToken values you got in the previous call. Notice that we're using the GET action here. Flip over to the website if you want, and make sure it was created. I implemented it in C#, so you can try it out from an actual language and not just Postman. Either copy from here (fill in your details) or try it on DotNetFiddle. Might as well clean up after ourselves. Now that you've created a bucket, how about deleting the bucket? 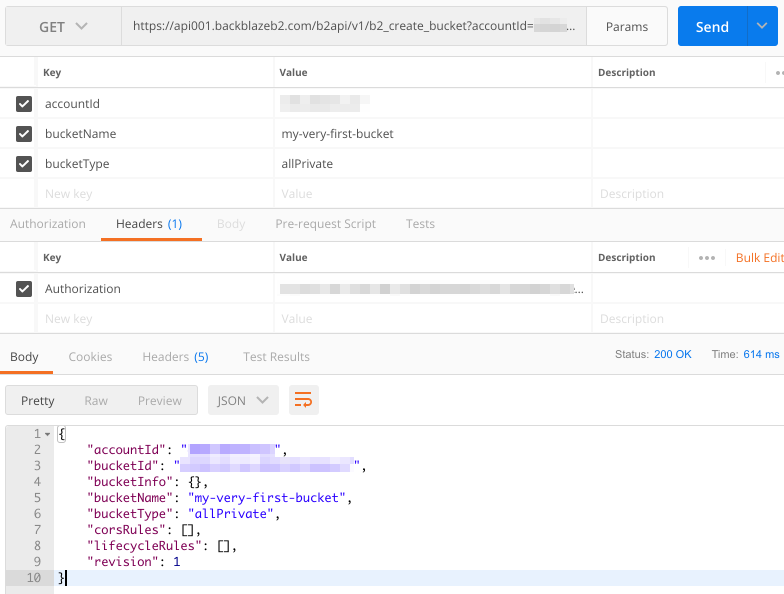 That's as easy as posting to the right endpoint and providing the id of the bucket (returned in the creation above). This highlights another odd decision though. REST provides a DELETE action that would've been more intuitive, so that a call like this could've worked (if they had designed it that way). One of the things I've noticed about REST is that there are few hard and fast rules... just a lot of guidelines, suggestions, and differing opinions. In this case it's not bad at all, but try hard enough and you can do some truly unintuitive stuff with REST. I implemented this one in C# too. Copy the code below or try it on DotNetFiddle. Don't forget to fill in your own details. It's great that the Backblaze API docs include sample usages in 6 different languages for each endpoint. This should make it far easier to get started, although I noticed the code snippets are a bit outdated, at least the C# snippet I started to use before I wrote my own. While Twitter uses OAuth 1.0 and Instagram uses OAuth 2.0, I'm not sure what Backblaze B2 uses. The "Authorization" header starts with "Basic", so is it an OAuth vs Basic thing? I guess I need to do some more research.